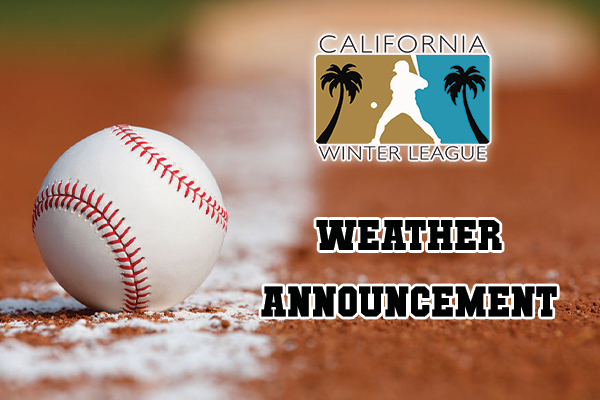 PALM SPRINGS, Calif. ~ Due to the anticipation of rain tomorrow, all games scheduled for February 14th have been canceled. These games will not be re-scheduled. CWL baseball action will continue on Friday, February 15th, with feature games at 10 AM and 12:30 PM. The 10 AM game will feature the Manitoba North Stars and the Alberta Grizzly, followed by the 12:30 PM match up featuring the British Columbia Bombers and the Toronto Rush. As always, Friday is Canada Day where all Canadian residents with a valid Canadian ID get into Palm Springs Stadium for just three dollars! If you can’t make it to the ballpark, be sure to catch our broadcasts on Facebook Live with first pitch at 10 AM.